Considering taking a stand at a key trade exhibition? Taking a stand at a trade exhibition is one of the most effective ways to meet both existing and new customers in order to help fill your pipeline and secure new business. However, many companies who would like to exhibit either lack any experience or, if you have done so in the past, feel daunted by the sheer amount of time needed to organise a successful exhibition. Help is at hand from the team at OB2B Industrial Marketing & PR, which can provide a total project management service from concept to reality. For companies with none or very limited experience of exhibiting, or for overstretched marketing people in a company needing short term project support to successfully deliver an exhibition, then the OB2B team can help. 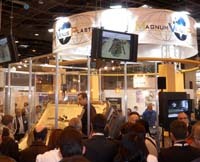 We have successfully delivered many exhibition projects at trade shows around the world. Depending on what support you need we can help with any aspect of an exhibition to get the many tasks needed done. This can include everything from booking the space and getting a stand designed, to ordering any furniture, helping with stand content and project managing all the graphics, giveaways and literature needed. We can also handle the promotional side for the show itself as well, such as organising any PR, booking any advertising or show promotional tools, and booking slots for your company to do a demonstration or give a technical presentation at the show. Doing key promotional activities before an exhibition will significantly help to attract greater numbers of ‘quality’ visitors to your stand. In addition to planning and project manning your exhibition stand, the OB2B team can also organize and deliver effective pre show promotional activities such as, writing and circulating press releases, designing and sending out an e-blast, and booking slots for your company to do product demonstrations or to present a seminar paper during the show. Exhibiting is expensive, so you owe it to your business to get the best return from your exhibition investment by doing effective pre show publicity. Samantha Bell, Global Marketing Manager, Scott Bader Company Ltd, Wollaston, UK.